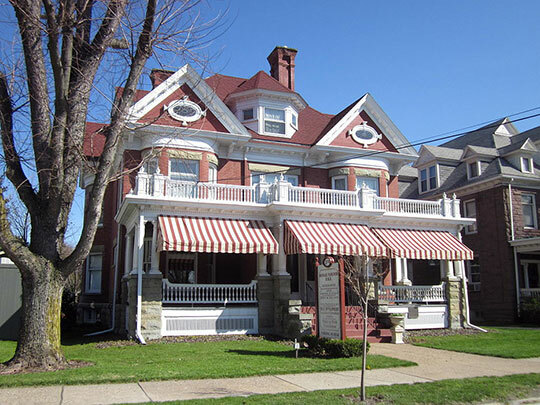 Punxsutawney Borough Hall is located at 301 East Mahoning Street, Punxsutawney PA 15767; phone: 814-938-4480. Photo: T. M. Kurtz House, ca. 1904, 312 West Mahoning Street, Punxsutawney, PA. Listed on the National Register of Historic Places in 1988. Photographed by User:Doug Kerr (own work), 2012, [cc-by-2.0 (creativecommons.org/licenses/by/2.0)], via Wikimedia Commons, accessed July, 2014. The oldest town in Jefferson County, it was incorporated from Young Township in 1849, with a population of 100, and long has been known as Punxsutawney, from the Iroquois, meaning the sand-fly (gnat) place, a pest that discouraged many a pioneer. Missionary John Ettwein tried to start a settlement on the site in 1772, with his aforementioned Indian converts, numbering about 240 people, but the gnats proved too much and the whole group went on to Ohio. As Gnat-town, the whites made it into a fine hamlet. The Moravians called it Ashtown, from the amount of black salts (potash) which was derived from the ashes of burnt trees. Population in 1943 was approximately 9,500. Population in 2008 was approximately 6,000.